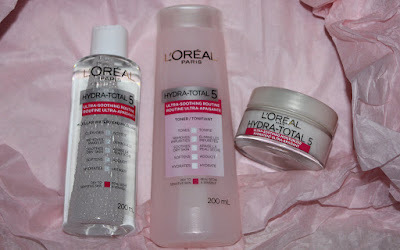 Azeroth Mommy: L’Oréal Paris Hydra-Total 5 Ultra-Soothing REVIEW. They are in order in the picture above. As follows 1.Ultra Soothing Micellar Water. 2.Ulra Soothing Toner. 3. Ultra Soothing Moisturizer. Alright so this product states that it :Removes Make-up, Softens, Illuminates, is easy to apply and irritation free. Are all of these true? It definitely removes make-up. Multiple times I have done my foundation and the whole works... come home and put some of the micellar water on a cotton make up pad and wipe all my makeup off. No water needed. It does soften my skin. It makes my skin feel super soft and clean. It's easy toapply and it does NOT irritate my skin. I use it every day and I love it. The downside to the micellar water ( keep in mind this might just be me ) but I find after a while it has an odd smell to it. Anyone else notice this? It claims " It removes impurities and leaves skin perfectly toned and soft to the touch"
The toner is probably by far my favourite toner I have ever used. It's gentle, it smells great and it has a somewhat cooling effect to my face. It is a soft gel consistency, and goes on smooth with a cotton ball. This also leaves my skin feeling soft. Thumbs up for this L'Oreal. I use this every day as well. "Non greasy formula with omegas and ceramides, provides 24 hour moisture.Soothes, replenishes, softens and comforts skin, for softer and more supple looking skin." The moisturizer is probably my second fav out of this trio. I don't need that much of the product, only about a nickel amount. It doesn't make my hair feel greasy in the slightest and it has a great scent to it. It's light and keeps my face moisturized the whole day. 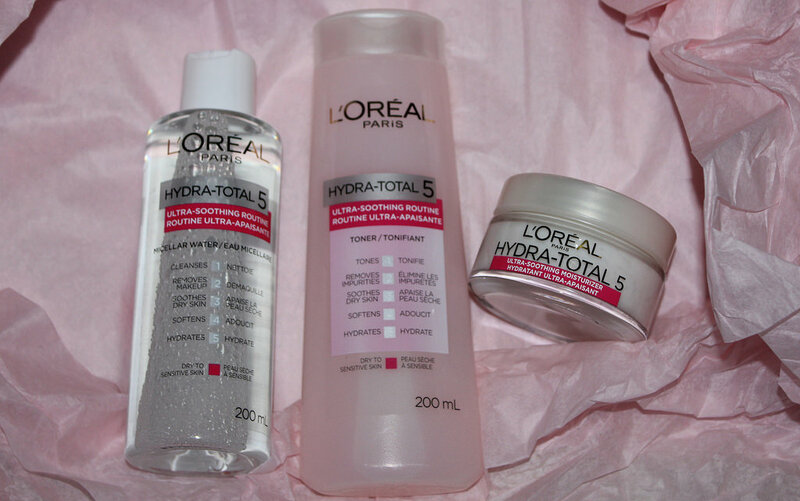 Overall I'm very impressed with these products from L'Oreal. They are gentle on the skin and leave my face feeling super soft, without the breakouts. It is my only skin care routine now. Once I use these products up, I'll be repurchasing them for sure.